Gado Gado is an authentic vegetarian Indonesian salad, full of protein (tofu + usually with boiled eggs, but I somehow missed them) – with a dense peanut sauce that takes the dish next level. Let’s be honest, I would dip anything into that sauce – or just eat it on it’s own!! A multi-layered veg delight, a combination of raw and cooked, sliced and arranged. Assorted chopped veggies – including crispy lettuce, carrot, boiled potato, cucumber, tomato, peppers, cabbage, beans, spring onions, sprouts + boiled eggs. Mix all of the sauce ingredients together in a bowl. Gently add a little boiled water at a time until you get a nice thick sauce consistency. Set aside. Drain the tofu on paper towel + pat dry carefully. Add the corn flour, shichimi togarashi, sea salt + cracked black pepper into a small bowl (to taste). Set aside. Add a tbsp or so, of coconut oil to a frypan over a med-high heat. Serve immediately with chopped veggies + peanut sauce. It’s soo handy having essential oils on hand to cook with, not only do they provide meals with a potent + powerful flavour, but they also allow the consumers to enjoy the internal health benefits that the essential oil may hold, as well as providing a safe, natural way to flavour your food. Offering convenience when fresh ingredients are not available. Frequently used for their internal benefits, essential oils provide a simple way to promote wellness in the body. Depending on the oil, you can use essential oils to promote healthy digestion, cleanse the body, support healthy function of the body’s systems, provide the body with antioxidants, and other internal benefits. PLEASE NOTE: Not all essential oils are safe for consumption. Always refer to reliable sources, that provide information about the safe internal use of essential oils. doTERRA identify their essential oils that are considered safe to add to your food + beverages in the below eBook, Cooking with Essential Oils – (along with those not to), PLUS; safety, usage, best practices, recipes + plenty of other helpful information. Not all essential oils are created equal. It is imperative to use high quality, thoroughly tested oils, that are food grade. There’s always a place for herbs and spices – we need the variety of nutrients they offer! But sometimes, it’s just easier to add a drop or two of essential oil, instead of spending time chopping, slicing + prepping. On other occasions, an essential oil can take the place of a recipe’s artificial flavouring ingredient. To shop doTERRA essential oils visit MY ONLINE SHOP (instructions are on the right) or alternatively, email naturalhealthconsciousliving@hotmail.com for my assistance! Once you begin to make your own mayonnaise and realise how simple and delicious it is, it’s going to be your go-to condiment for a variety of dishes. This is your basic starting mayonnaise, but of course you can add additional ingredients and flavours – depending on what you are serving it with. This mayo is packed with protein and good fats and tastes incredible. This recipe is fail proof and the emulsion is going to work every time, provided you are slow and steady with the addition of olive oil. Tonight for dinner I made a lemon & dill variation and paired it with pan fried salmon and home cut sweet potato hash browns. The mayo made the dish! Add all of the ingredients into a food processor (bar the olive oil). Turn the setting to low, and slowly trickle the olive oil in as the mayo is processing. 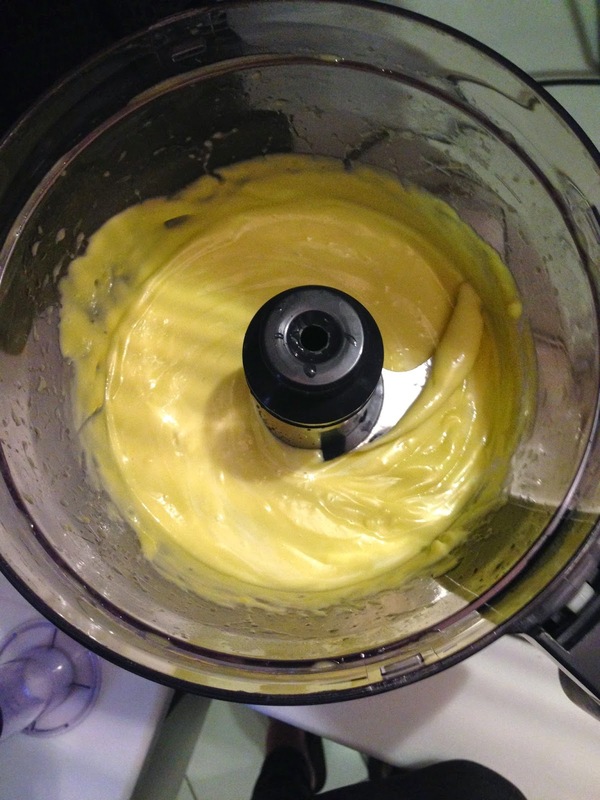 Continue to process on low until all of the olive oil is dispensed and your mayo is smooth and thick. You are now ready to jar up. This should keep in the fridge for around 5 days.